Here is what we have lined up for you in 2017! Save the dates! More details to come as we get them! Celebrating the breadth of Chicago’s enduring storytelling and live lit scene, Lifeline Theatre and Live Bait Theater are thrilled to bring 15 storytelling collectives and numerous solo performers together for a three-week, multi-venue selection of powerful personal stories. 1/13: Can You Feel the Love Tonight? Featuring Storytellers: Allison Reese (host), Sami Wolf, Mary Tiden, Casey Copless, Amy Thompson, Kenzie Seibert, Vivian Ellis, Britt Ferguson, Gaby Dixon, Molly Kearney, Holly Lambert, Greg Phelps, Julie Fishbach, Peter Kim, Shannon Noll, Parker Callahan, Dave Lyzenga, Emily Dixon, Laurel Pelton, Lanny Fox, and more! February Fridays: Control Alt Right Delete, 9pm, Judy’s Beat Lounge. Our brand new sketch comedy revue currently in development, performed in the wonderful theater that Second City dedicated to our beloved founder, Judy Fabjance. Details coming soon! GayCo is back in the NW burbs and for one night only, join GayCo and celebrate any LGBT right we’ve managed to attain in the last 3 years before they put it down, flip it and reverse it. Ti esrever dna ti pilf nwod ti tup…. 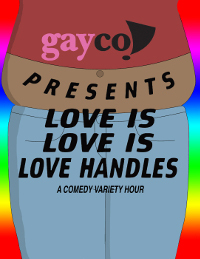 GayCo is back with their over-the-(muffin)-top sketch comedy revue for the LGBT-etc community, featuring a mix of the funniest scenes from their 20 year history to provide you all the love and laughs you can handle.